Happy 60th Birthday, Douglas Adams! This is what I posted eleven years ago, when I found out about Douglas Adam’s death. It seems an odd thing to post today, the date of what would have been his 60th birthday, but it’s heartfelt, and sometimes “heartfelt” is enough. Like so many of us, his life and works were hugely influential on mine. 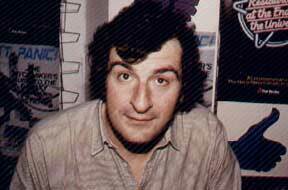 I met Douglas Adams once, in 1981. He was signing books and cassettes (CASSETTES!) 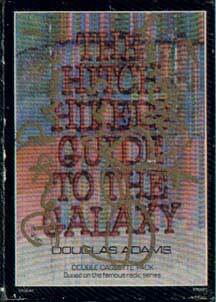 of The Hitch-Hiker’s Guide to the Galaxy at the Forbidden Planet, when it was just a small store on London’s Denmark Street. This was before I worked there: I was studying Astrophysics at Queen Mary College, University of London (a vital course for anyone wishing to seriously pursue a career in cartooning), so that Saturday I and several mates made the trip down the Central Line to meet him. He seemed a completely affable fellow, decent and polite and just very, very happy to be in front of a gobsmackingly huge line of fans such as myself. The queue stretched around the block, but even though I was at least halfway down it, by the time I got to meet him, he seemed just as genuinely pleasant and personable as if I’d been first in line. My pal Poz snapped the shot of him above, and he signed a couple of books and the new audio recording (right) that I’d just bought. As people know, Douglas Adams was only 49 when he died of a heart attack in Los Angeles this weekend. And while I’d love to say “So long, and thanks for all the fish,” somehow it doesn’t seem nearly enough. Some people deserve to grow to a very ripe old age. Douglas Adams was one of them.